As most of you know, I LOVE to run. It's my therapy. I can sort through my thoughts, plan my day, release some major stress and walk away on my "Runner's High". Each time I run, I want to run faster, more fluidly, but to do this I have to track my pace and miles so that I don't run (no pun intended :) the risk of over training. This is one of the many reasons I love my Nike Sportswatch Powered by TomTom! I did my research on the different types of GPS tracking watches. Garmin has a few good ones too. But the interface of the Garmin watches are not as easy to read. All I have to do is plug the watch into my USB on my computer and it loads my workouts into NikePlus.Com and charges it at the same. 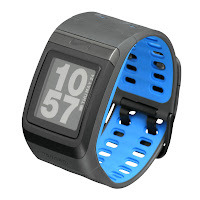 Whether you are a beginner, casual runner or elite, I definitely recommend purchasing a sportswatch to have more efficient, accurate training.